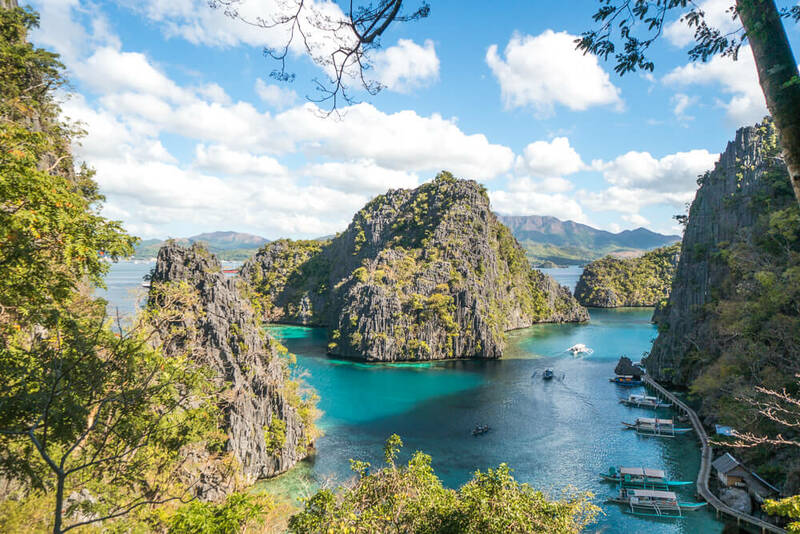 Coron Island, Palawan, is one of the top destinations in the Philippines, known for its beautiful nature and some of the best wreck diving in the world. 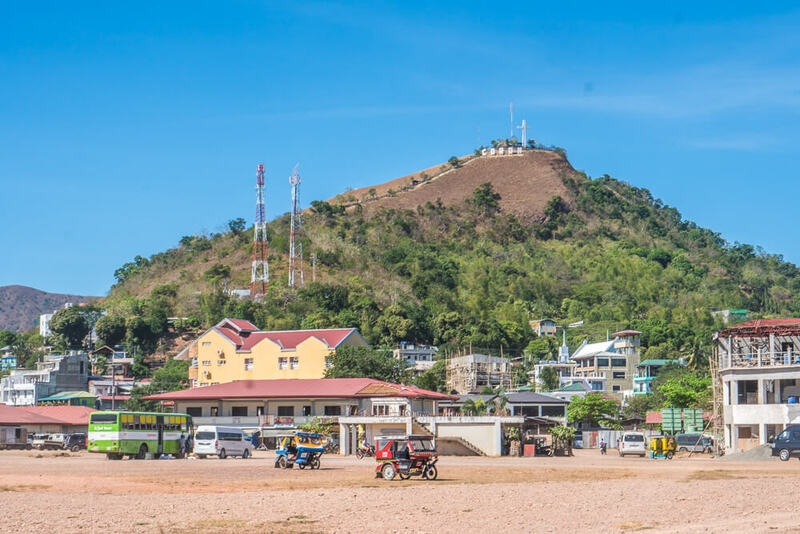 Although Coron Town is actually on Busuanga Island, a number of island hopping tours depart the town everyday to explore the beauty of Coron Island. It’s not possible to stay on Coron Island itself in order to preserve the pristine nature of places like the famous Kayangan Lake. Many tourists take advantage of Coron Island tour packages which cover as much as possible in a short amount of time, but we recommend doing it yourself as it’s cheaper and you can be more flexible. Whatever you do though, don’t miss Coron, Palawan, off from your Philippines itinerary! 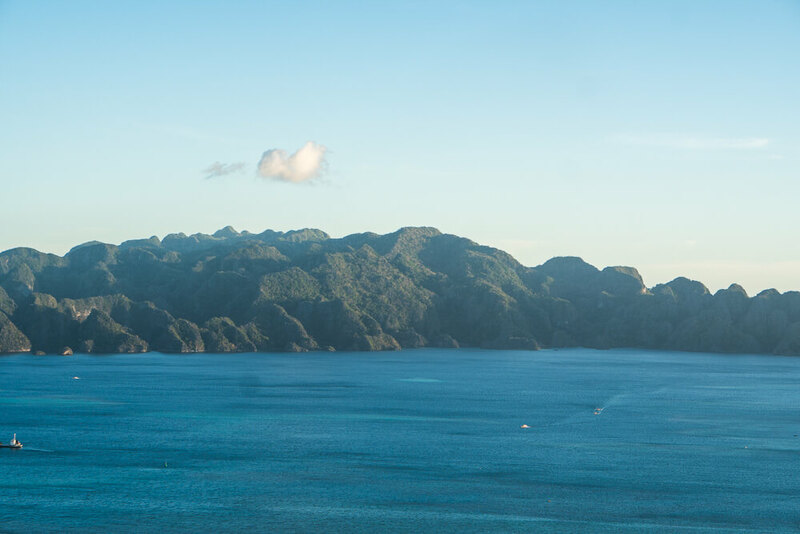 Find out everything you need to know about visiting with this Coron Island travel guide. Make sure you have everything you need for your trip with this packing guide for the Philippines! It covers everything you need to take to make the most of your trip! 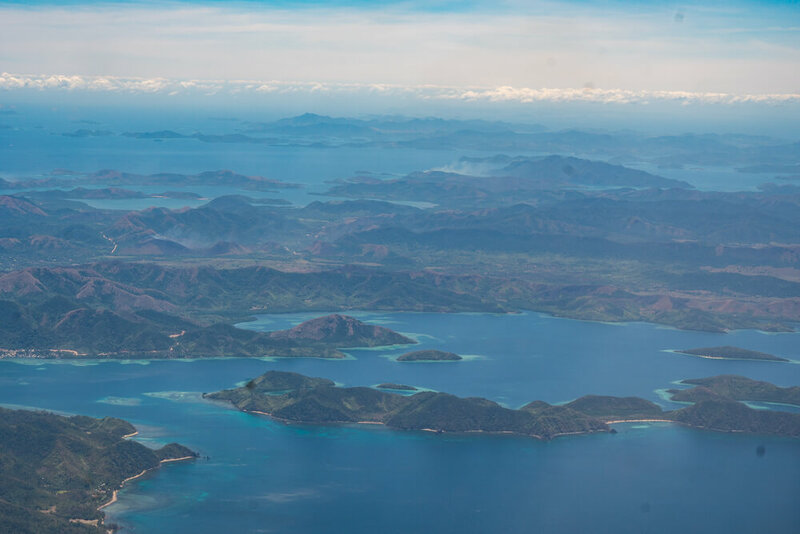 Flights – The easiest way to get to Coron Island is by flying into Francisco B Reyes airport, on Busuanga Island, Palawan. You can find flights to Coron from a number of places in the Philippines including Manila, Cebu, El Nido and Puerto Princesa. The cost will vary depending on where you are coming from and which operator you choose – with Cebu Pacific, Philippine Airlines and more servicing this airport. We recommend booking in advance for the best deal – click here to find the best fares on Momondo. If you’re going to Coron from El Nido it’s cheaper just to get the ferry rather than flying. From the airport to Coron Town you can get a shared van which costs 150 pesos per person and leaves when full. Ferry – If you’re already in Palawan, you can catch a ferry from either Puerto Princesa or El Nido to Coron. If you’re in Port Barton, you’ll need to make your way to El Nido to catch the ferry. From El Nido, we recommend taking the fast ferry run by Montenegro Lines. This ferry departs at 6am and takes approximately 4 hours to reach Coron, costing 1,760 pesos. Click here to book your ferry in advance through 12Go Asia to avoid tickets selling out! There are other ferry options that are slightly cheaper, but take longer and run less frequently. We recommend reading this guide to catching a ferry between El Nido and Coron if you’re interested in the other options. Ferries run once a week from Puerto Princesa to Coron but due to the distance it’s a 15 hour journey. To avoid this long journey, either fly directly to Coron or get the ferry from El Nido instead. If you do want to go straight from Puerto Princesa to Coron by ferry, click here to find the timetable and pricing information. There is also a ferry from Manila to Coron but there may only be one departure a week depending on the season. It takes around 15 hours and so flying is a much better option if possible! It’s easy enough to get around Coron Town on foot but if you’re staying a bit further out you may need to use a tricycle. Fares should be relatively cheap, but it’s worth checking with your accommodation how much you should expect to pay. This way you avoid being overcharged. To visit areas outside of Coron Town, you may want to hire a scooter. It should cost between 400-700 pesos to rent a scooter for a day, and gives you the freedom to take a tour of the Coron area at your own pace. The best time to visit Coron, Palawan, in terms of weather is influenced by the dry and rainy seasons. Unsurprisingly, the dry season sees a lot less rain and so is a nice time to visit. The rainy season isn’t as bad as the name suggests though, as it rarely rains all day long and there are still days without any rain at all. Coron Dry Season – December-April. Coron Rainy Season – May-November. Coron’s rainiest months are June-October, so it’s best to avoid these if possible. In general, you should try to visit Coron during the dry season for the best weather. Temperatures stay constant in Coron with a peak of around 30 degrees Celsius all year round. The peak time to visit Coron is between December and April. If you’re visiting during these months it’s best to book accommodation in advance to avoid a lack of options. Mount Tapyas – One of the best and most popular options for what to do in Coron at night is climb Mount Tapyas. Standing at a height of 210 metres, Mount Tapyas is the perfect spot to watch sunrise or sunset in Coron town. To reach the top you’ll have to climb over 700 steps, but it’s well worth it! Even if you decide to visit during the middle of the day, the view is incredible. 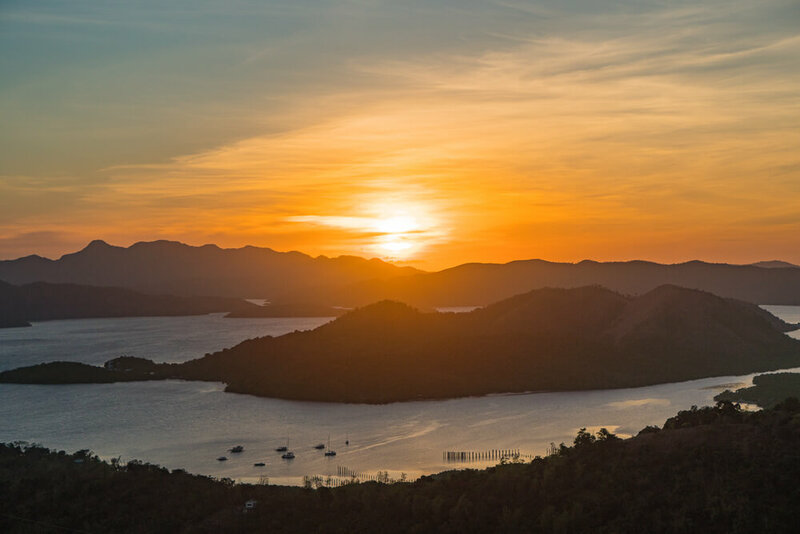 The scenic view of Coron bay and the area’s countless hills is spectacular, and so we’d consider a visit to Mount Tapyas essential when in Coron. It can get pretty crowded at the top during sunset, so if you want to avoid the crowds we recommend visiting Mt Tapyas at sunrise. There’s no entrance fee to visit Mt Tapyas, so you can get the best view of the area for free! Island Hopping – Coron is home to some incredible nature, and the best way to see it is with an island hopping tour. You have the option of joining a group tour and following a set itinerary, or renting a private boat and deciding the exact spots you want to see. Coron Island tour rates start from around 700 pesos per person depending on the itinerary and operator. The cost of a group tour should always include lunch and entrance fees. It’s also worth paying particular attention to the itinerary to make sure you don’t miss out anything you were hoping to see. Itineraries vary from tour to tour so pick wisely! Tours are available from a number of stores in Coron, so there’s no need to book in advance. The price to rent a private boat starts from around 2700 pesos – but this doesn’t include entrance fees or your lunch. This price may rise if you have a larger group or want to visit places that are further away, like Malcapuya Island, so check the rates quoted before agreeing to a boat! If you opt to rent a private boat you can choose up to 6 spots you’d like visit around Coron. Private boats in Coron are arranged by the Calamian Tourist Boat Association. One of the most popular spots to visit is Kayangan Lake, and so it’s included on most tours packages in Coron, Palawan. The lake is a mix of fresh and salt water and is claimed to be the cleanest lake in Asia. You have to ascend and descend a number of steps to reach the Kayangan Lake, passing by a brilliant viewpoint from which you can admire the karst limestone cliffs and beautifully blue waters of Coron Bay. Once you reach Kayangan Lake itself, take the time to swim and enjoy the impressive scenery. The lake’s beautifully clear water and the surrounding cliffs make for a majestic sight. Life jackets are mandatory when swimming in Kayangan Lake as 2 tourists drowned there in 2017. 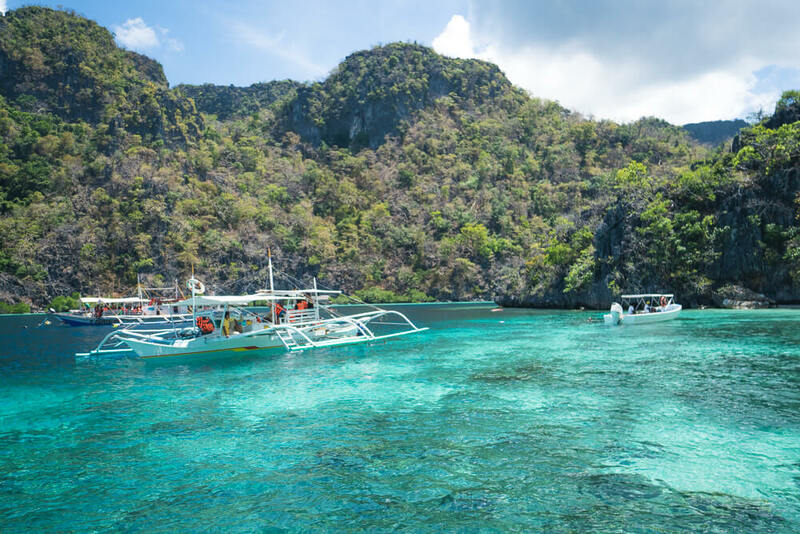 As one of the most popular places to visit in Coron, Kayangan Lake can get extremely busy, so we recommend making it your first stop if you rent a private boat. If you’re travelling with a drone, it’s worth noting that drone use is no longer permitted at Kayangan Lake. One of the other points of interest on Coron Island that we recommend visiting is Twin Lagoon. As the name suggests, there are 2 lagoons – one which can be accessed by boat and one which cannot. Your boat will dock in the first lagoon and you can reach the second one either by swimming through a small opening in the cliff or by stairs. The water at Twin Lagoon is also a mix of fresh and salt water, and you can feel the difference in temperature between the two. If you snorkel, you will be able to see blurry patches, where the different types of water meet. The only downside of a visit to Twin Lagoon is that you won’t be able to have it all to yourself due to it being one of the most popular places to visit in Coron, Palawan. Barracuda Lake is a similar spot to both Kayangan Lake and Twin Lagoon, and is on the itinerary for some Coron island hopping tours. The lake gets its name from the singular resident barracuda – although it can be quite elusive. It’s a particularly interesting spot to visit as the lake has layers of water at different temperatures, known as thermocline. At the top of the lake the fresh water is around 28 degrees celsius, in comparison to around 38 degrees at 15 metres deep – quite the difference! Although you don’t have to dive to visit Barracuda Lake, we’d recommend doing so to fully appreciate this fascinating place. One of the best snorkelling spots to visit during a Coron Tour is Siete Pecados. This reef is home to an abundance of coral and sea life. 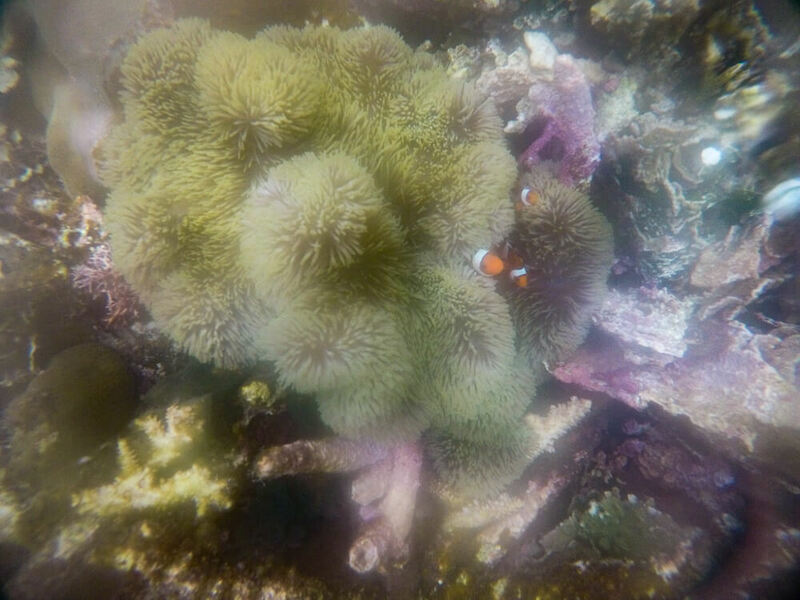 It’s common to see clownfish, barracuda and squid, but if you’re lucky you may even see a turtle or sea snake. If you aren’t a qualified diver but want to enjoy one of Coron’s shipwrecks, you’ll want to visit Skeleton Wreck. With a depth ranging from 5-22 metres, the wreck is easily visible from the surface. If you’re a confident swimmer you can get a lot closer if you hold your breath and dive down to get a better look. There’s a mix of sea life around the wreck too, which makes it a great place to visit. On top of the above, there are a number of islands to visit with stunning beaches to offer. As these islands are further away from Coron, we opted to explore the nearby sites during our trip. Malcapuya Island in particular is supposed to be beautiful if you do plan to go further afield. If you don’t have time to see the beaches in Coron, we recommend visiting Siargao as there are some beautiful beaches to visit on the island hopping trips there! If you do opt for a private tour, then you will be shown a list of places you can choose to visit. It’s best to have done some research in advance to decide which spots you want to visit. This way you won’t end up missing anything out. We recommend being specific on the order in which you want to see places, as some get very busy early on. We did a private tour and they tried to take us to Siete Pecados first, but we insisted on going to Kayangan Lake instead. It’s lucky we did, as by the time we were leaving Kayangan Lake at around 9am, it was already getting a lot busier. Maquinit Hot Springs – Just 30 minutes from Coron Town, one of the world’s only saltwater hot springs can be found. The Maquinit Hot Springs are a popular spot to visit, especially after climbing Mount Tapyas, as it gives your body chance to recover in the soothing waters. To get to the hot springs, a tricycle costs around 300-400 pesos from Coron Town. The Maquinit Hot Springs have an entrance fee of 200 pesos, and open at 8am until 10pm – although the entrance is closed at 8pm, so you need to arrive before then. Dugongs – If you’re a nature lover, take a trip from Coron to the other side of Busuanga Island to go on a Dugong watching trip. Dugongs are listed as a vulnerable species, so it’s a great opportunity to see them in the wild. Trips are run by the Dugong Dive Center, who have a number of partner resorts nearby. It’s best to stay in one of the partner resorts as tours depart at 7am. Alternatively you can make your way from Coron Town, but this requires a very early start! Once a Dugong is spotted, you will watch from the boat initially before getting in the water to snorkel and get a closer look. As long as the Dugong isn’t scared off, you will then have the chance to dive too – assuming you’re qualified! Obviously there isn’t a guarantee of seeing Dugongs, but they do find them on over 80% of trips. The cost of doing a Dugong watching trip is quite high, with the boat trip itself costing 3,500 pesos per person. On top of this there is a cost of 1,350 pesos per dive (up to 3 dives) and another 1,350 to rent scuba gear, if needed. If you are planning on staying in a partner resort you will also have to factor in this cost, or alternatively the cost of transport from Coron to the Dugong Dive Center. Wreck Diving – Coron is known for having some of the best wreck diving in the world. During World War 2 a number of Japanese ships were sunk around Coron bay as a result of an American airstrike. There are plenty of dive schools in the area offering day trips to explore these fascinating wrecks. Some wrecks are shallow enough to snorkel, but most require an Open Water or Advanced Open Water certification. Many of the wrecks are too deep for Open Water divers, so to fully appreciate the wrecks of Coron it’s best to be an Advanced Open Water diver. Alternatively, you can opt to take the Deep and Wreck specialty courses at one of the dive schools, which will enable you to appreciate them without an Advanced Open Water certification. Wrecks in Coron requiring Open Water certification – East Tangat, Kogyo Maru, Lusong Gunboat. Wrecks in Coron requiring Advanced Open Water or Specialty certification– Akitsushima, Irako, Okikawa, Olympia Maru, Morazan Maru. Wrecks in Coron visible by snorkelling – Skeleton Wreck, Lusong Gunboat, East Tangat. Although Okikawa is shallow enough for Open Water divers, there are often strong currents, which mean you need more experience for the dive. Click here for more information on Coron’s shipwrecks. More Diving –If you want a change from wreck diving, there are a number of other dive sites in Coron. Barracuda Lake is a unique place to dive due to the thermocline water – meaning the water is notably different in temperature depending on your depth. There are also a number of reefs to dive in Coron – with Siete Pecados being a particularly popular spot for both snorkelling and diving. Click here for more information on diving Coron’s reefs. One of the best budget options in Coron is Amphibi Ko Resort. It’s well located a short distance from a number of restaurants and in walking distance of Mount Tapyas. There’s also a lovely rooftop restaurant on site with pleasant views to enjoy during your meal. Rooms have air conditioning and hot showers, which makes this a great value property for the price. Staff are also on hand to help arrange tours of Coron if you want! Rooms are available from $28 USD (1,500 pesos) per night, with breakfast included in the price. Click here to check the latest prices at Amphibi Ko Resort for your trip to Coron! Another great budget option is Sea Horse Guest House. The property offers both dorms and private rooms, with a free breakfast included regardless of which you opt for. You’ll find plenty of restaurants nearby and the pier is within walking distance for taking day trips around Coron. There’s also a lovely rooftop terrace, which is a great place for watching sunset – especially if you don’t fancy climbing all those steps at Mount Tapyas! All the rooms at the property have air conditioning, with rates starting from $7 USD (400 pesos) per night for a bed in a dorm, and $28 USD (1,500 pesos) per night for a private room. Click here to see the latest offers at Sea Horse Guest House for your trip! One of the best value hotels with a pool on Coron Island, Palawan, is Bluewave Hotel. The rooms are very clean and equipped with air con, which means you’ll stay cool even when you’re not using the pool! Everything is within walking distance, so you’ll have plenty of restaurant options to choose from. If you’d prefer though, dine at the property on the 3rd floor restaurant, which offers lovely views of the area. We’ve seen discounted rates on Agoda from $60 USD (3,200 pesos) per night, although prices may be higher or lower than this. Click here to see the latest prices at Bluewave Hotel for your trip to Coron! Another great value option with a pool to cool off in is Sunz En Coron Resort. Although the property is a little way out of town, they offer free tricycle rides there which more than makes up for this! The staff are extremely friendly and are more than happy to help with your trip in any way they can. All rooms in the property have air conditioning, so you won’t have to worry about sleepless nights from the warm weather! Rooms are available from $56 USD (3,000 pesos) per night. Click here to see the latest deals at Sunz En Coron Resort for your trip! If you’re looking for a more luxurious stay, consider booking a stay at the Two Seasons Coron Bayside Hotel. The rooms are comfortable and spacious, and the property has a lovely swimming pool overlooking the ocean and beautiful surrounding areas. Although the hotel isn’t located in the main area of town, it’s a short tricycle ride away so it isn’t really an issue. Rooms are available from $128 USD (8,000 pesos) per night. Click here to see the prices for a stay at the Two Seasons Coron Bayside Hotel for your trip! One of the best resorts near Coron Island, Palawan, is the Sunlight Eco Tourism Island Resort. The property offers a unique island getaway, a 30-minute boat ride from Coron town. It’s the perfect place to relax, whether you choose to spend your days chilling by the pool, relaxing on the beach or snorkelling in search of marine life! Everything you could want from a resort is waiting for you at the Sunglight Eco Tourism Island Resort. Rooms are available from $340 USD (18,200 pesos) per night. Click here to see the latest prices on Agoda for a stay at the Sunlight Eco Tourism Island Resort! Brujita – If you’re a vegan wondering where to eat in Coron, try out the vegan friendly Brujita. The menu is also suitable for non-vegans, with a good variety of dishes on offer. We at here a number of times during our stay in Coron, and the barracuda was particularly good. While we didn’t try enough places to say it’s the best seafood restaurant in Coron, it definitely gave a good account of itself! It’s a good option for cheap food in Coron, with some dishes available for under 200 pesos. Brujita is a popular spot, so if you arrive after around 7pm then expect to have a bit of a wait for a table! La Sirenetta Restaurant and Bar – La Sirenetta is one of the most popular restaurants in Coron, partly due to its lovely location on the waterfront. A range of dishes are available, from pizza to seafood to Filipino cuisine. La Sirenetta is slightly more expensive than some other options in Coron, but the location makes it worth it! Pedro’s Gelato – There’s not much better than ice cream on a hot day! Pedro’s Gelato is the go to place if you’re hoping for something to help you cool down. There are plenty of ice cream/gelato flavours to choose from – with the salted caramel being one of our personal favourites! Altrove – It can be hard to find a good pizza when travelling South East Asia, but Altrove is one of the exceptions. Although the prices are higher than elsewhere, the quality makes a real difference. Altrove also serve pasta, although we didn’t get a chance to try this ourselves. Expect to pay upwards of 300 pesos depending on what you opt for. 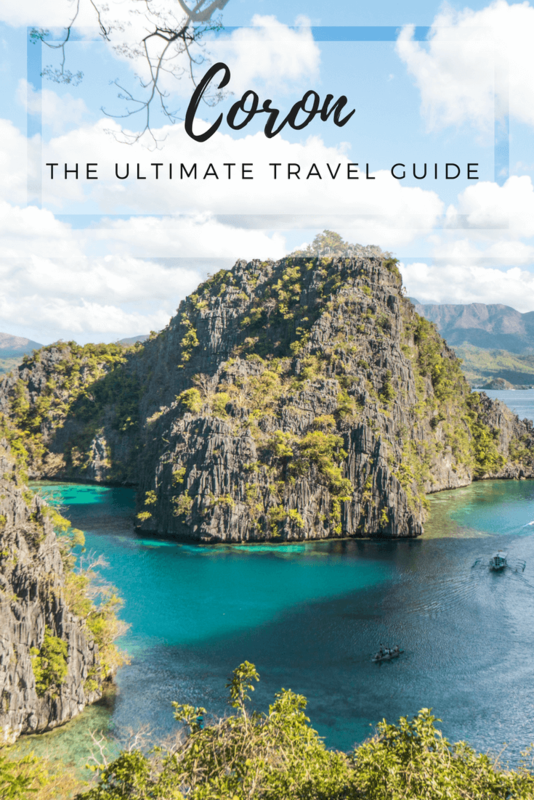 Like this Coron Island travel guide? Pin it!